Modern pumps have achieved loftier feats. For instance, in the late 1990s, NIST developed a device that could pump individual electrons, part of a potential new standard for measuring capacitance. While pumps can be operated mechanically, electrically or via any other source of energy, they all share the common feature of being driven by a periodic action. In the Archimedean pump, that action is a full rotation of the handle, which draws up a certain volume of water. For the NIST electron pump, it is a repeating pattern of voltage signals, which causes electrons to hop one at a time between metallic islands. But physicists have sought for decades to build a different kind of pump—one driven by the same kind of periodic action but made possible only by the bizarre rules of quantum mechanics. Owing to their physics, these pumps would be immune to certain imperfections in their fabrication. Now, a team of physicists working in collaboration with JQI Fellow Ian Spielman and NIST postdoctoral researcher Hsin-I Lu has created just such a pump. By periodically jostling many individual atoms, the researchers were able to shift an entire atomic cloud without any apparent overall motion by its constituents. The team is the first to test this predicted behavior, which arises in what they call a geometric charge pump. The work follows close on the heels of two recent papers that examined topological charge pumps, which demonstrate a distinct but related effect. The new result was published May 20 in Physical Review Letters. 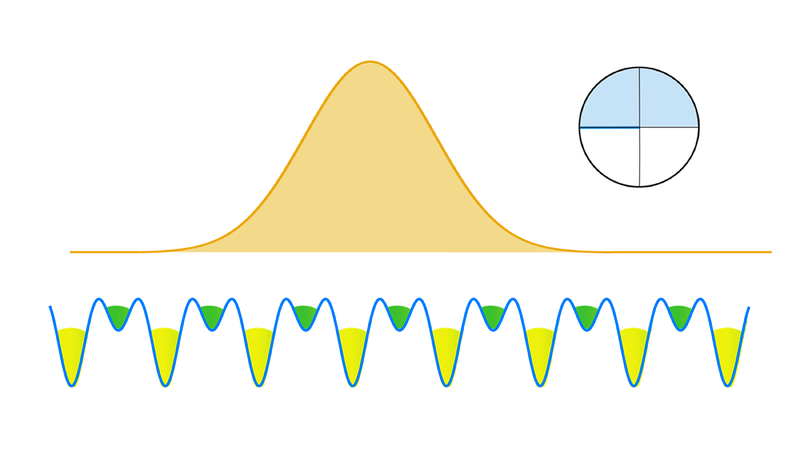 The experiment builds on other work by Spielman and his team that involves the precise manipulation of cold atomic clouds known as Bose-Einstein condensates (BECs), in which each atom occupies the same quantum state. “These cold atoms are a useful platform to study theoretical ideas that can’t be tested with ordinary condensed matter systems,” says Spielman. For example, he explains, it’s not obvious how to experiment with periodic changes in a solid crystal like sodium chloride—common table salt—that shares its two-part structure with the BEC. The organization of the crystal is too rigid to be easily modified in place. The idea of a quantum pump dates back to 1983, when a physicist at the University of Washington asked a theoretical question: What would happen if quantum particles, confined in a one-dimensional array, saw their potential energy landscape—the backdrop that influences their motion—gently deformed and then returned to its original shape? From the point of view of the particles, everything would look the same at the beginning and the end of this cycle, so it’s natural to expect that nothing would happen. However, due to a quantum phenomenon known as Berry’s phase, the paper predicted that the particles’ motion could actually be modified. Berry’s phase is a consequence of quantum physics, but it has a direct analogy to motion on a curved surface. Imagine an arrow pointing straight up, grazing the equator of a sphere. If it is transported along a path toward the north pole, then brought back down a different path to the equator and finally returned to its original spot, it will no longer be pointing straight up. The arrow will be rotated by an amount that depends on the path it took. This mismatch between the initial direction that the arrow points and the direction it ends up pointing is due to the curvature of the sphere. Berry’s phase is the imprint a quantum particle gains as it is “transported” along a curved path, although this movement isn’t necessarily through physical space. In fact, in the JQI pump, the curvature comes from energy differences that atoms experience over time. Each atom in the BEC sees an energy landscape with a left and a right well—troughs that the atoms tend to fall into. The repeating pattern of wells, all arranged in a line, is generated by interfering lasers at just the right frequency and power to trap rubidium atoms with the right quantum properties. By adjusting the power of the lasers and an applied magnetic field, the researchers traced out different paths through this see-sawing energy space, allowing the atoms to sample different amounts of curvature and thus different Berry’s phases. This allowed experimenters to adjust the amount that the cloud was displaced in each cycle, an effect they measured by transferring a small percentage of the atoms into a different quantum state and measuring the amount of light they absorbed. Here, Lu, Spielman and colleagues realized a novel aspect of a 1980s theoretical ideal, and Spielman says that the same cold atom platform could also be used to study condensed matter effects that appear at the boundaries of materials in different phases, like superconductors and semiconductors. Moving forward, he notes, it might be possible to create novel geometric and topological charge pumps with cutting-edge condensed matter systems, such as topological superconductors.